The latest Gnome Tweak Tool from GIT supports switching GNOME Shell extensions on / off (well, the new feature was added about 2 weeks ago but I've somehow missed it) with a click. Tweak Tool also got an option to install GNOME Shell extensions, but it was later disabled because it's too unstable for now. For those not familiar with GNOME Tweak Tool: this is an application especially designed for GNOME 3 that lets you change GTK, window and icon theme, tweak the fonts, show date in clock, re-enable the minimize and maximize, allow file manager to handle desktop and draw the desktop and lots more. 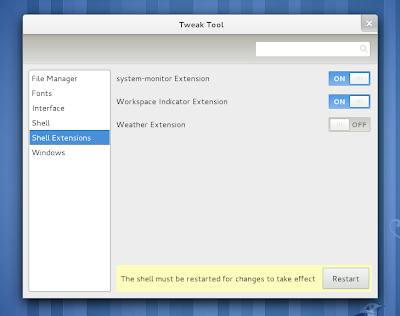 The new feature is very simple: you have an on/off switch and when you enable or disable a extension, Tweak Tool will let you know that you need to restart GNOME Shell to apply the changes. Then you should find a new folder called "gnome-tweak-tool" in your home directory. Inside it you'll find a file called "gnome-tweak-tool" - double click it and GNOME Tweak tool should open. Note: I've tested the latest GNOME Tweak Tool in Fedora 15, but it should work in Ubuntu (using the GNOME 3 PPA), ArchLinux, etc. too. However, it won't work if you've compiled GNOME Shell via jhbuild.